Implementation strategies have historically been difficult to measure. Generally, tracking strategies has been completed by observation and not by self-reporting on a comprehensive list of strategies [16, 17]. 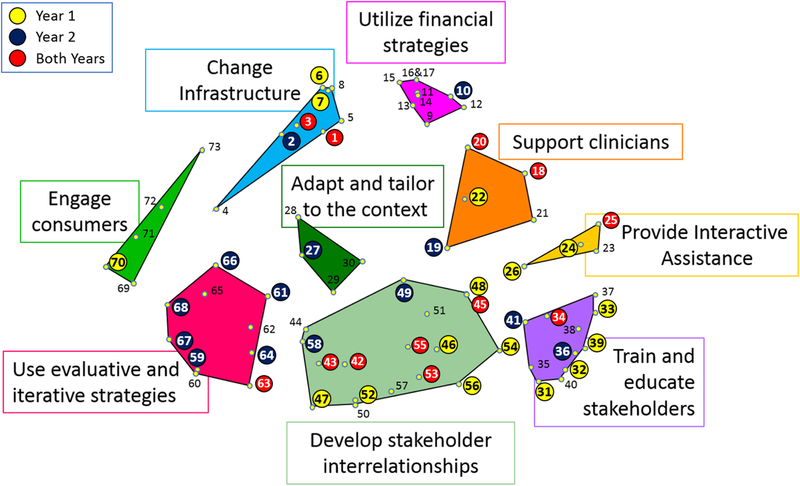 While we previously reported on developing a survey using the definitions of implementation strategies from the ERIC study, it remained unclear whether these strategies would be understandably and reliably interpreted by non-implementation scientists. In both years of data collection, we found an association between clinical outcomes with specific implementation strategies. The second year of data collection further demonstrates that providers could interpret and answer questions about implementation strategies. First, there was adequate interrater reliability within sites in both years. Second, there was consistency across the years in that several of the strategies were associated with treatment starts. Third, the strategies that were individually associated with treatment starts were in some cases those strategies supported by implementation literature. For example, facilitation is a well-studied strategy and was associated with higher treatment rates in Year 1 [18–22]. Fourth, we found that the providers were able to generally distinguish between similar strategies. The strategy clusters were designed to group similar strategies, and we did not find strong correlations between endorsement of specific strategies within a cluster. In fact, there was significant variation in endorsement of the strategies within clusters (where the most similar strategies are housed). These findings indicate that such surveys can be used to track implementation strategies across a wide range of provider types, education, and geographic locations.